NFL Teams Can't Stop Scoring. When Will They Stop Running And Punting? We saw lots of scoring in Week 1—791 points in all, the most for any first week ever and the second-most for any week. It's tempting to attribute the scoring explosion to the replacement refs—Mario Williams certainly wouldn't get in your way if you did—but it's more likely that the point totals are part of a much larger long-term trend, one that is having dramatic effects on how pro football is played. The passing game has never been more explosive. It's now trite to say the NFL is a passing league and the sport is a quarterback's game, but it's never been more true. If I had to hang my hat on one simple football statistic as a measure of a team and its prospects for winning, it would be yards per pass attempt (YPA). No other stat correlates so well with a team's fortunes. YPA has been on the climb for decades, ever since the rule changes of 1978. In the last few years, it has accelerated its climb. Last season YPA was the highest ever for the NFL at 6.7. This past weekend it was over 6.9 despite the influx of rookie passers. Offenses have slowly adapted to the rules over time, blindly feeling their way forward through trial and error, clinging a little too tightly to the myth that establishing the run is critical to success. Both sacks and interceptions have trended downward in the same period, making passing more lucrative and less risky at the same time. In comparison, rushing yards per attempt has barely budged, hovering around 4.1 yards per carry. The other big development in the sport is field goal kicking. Kicks have become longer and more accurate. In 1974, league field goal percentage was 60.6 percent. These days that percentage is in the mid-80s. And even that doesn't tell the whole story. In 1974, 36 percent of all field attempts were from 40 yards or beyond. Now that figure is typically well over 40 percent. The numbers aren't just trivia. These trends have had a big effect on strategy, incentivizing a different kind of play-calling than what football fans might be used to. First, we're seeing more passing and less running. That only makes sense. But there are deeper implications, too. The easier it is for offenses to move down the field to score a touchdown or make what has become a nearly automatic field goal, the less important field position becomes and the more important possession becomes. Punts don't make as much sense as they used to. When a team punts, it is essentially trading away a chance to keep possession in return for a field-position advantage. But when it takes Drew Brees or Tom Brady only two passes to make up that 30 or 40 yards of field position bought by a punt, you have to ask, "Why bother?" Additionally, these developments change the strategy equation in the end game. When offenses are in what they call the four-minute drill, trying to run out the clock with a single-score lead, they can no longer count on a run-only strategy. We used to talk about the two-minute drill, in which heroic quarterbacks lead their teams on a winning march down the field. Now, two minutes sounds like a quaint eternity. Offenses need only seconds to steal a win. In the Jaguars-Vikings game on Sunday, the teams needed only 1:18 to manufacture not one but two full, lead-changing drives totaling 10 plays and 11 points. What this means is that running the clock down to under one minute with a few runs and then punting is no longer a winning strategy. The teams that win will be the aggressive ones that pass the ball where a more conservative team might be content to run and chew clock. 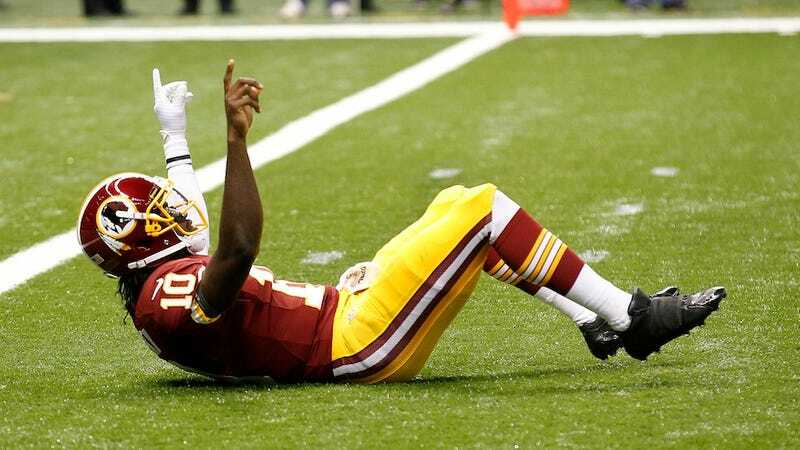 Rookie Robert Griffin III had a great first game, but his biggest play was not the 88-yard touchdown pass to Pierre Garcon. It was a 22-yard pass on second-and-13 from his own 17 with 2:22 left to play. It gave the Redskins a new set of downs and kept on the sideline a New Orleans offense that had just ripped off touchdown drives in 1:04 and 0:53. That single first-down conversion was the equivalent of a triple play with the bases loaded in the ninth inning. By the time Saints got the ball back, Drew Brees had only 22 seconds to work with. The game continues to change, and the teams that adapt will be the ones that win.